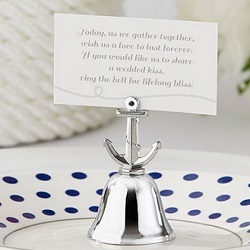 Many nautical wedding favor choices can be a lot of fun for your wedding guests. This theme is all about beautiful ships setting sail on high seas. It incorporates rich shades of blue with accents of white. You can even incorporate some surprising elements of the theme, such as the yellow and red of a sunset seen in the horizon or the promise of warm sand between your toes when you reach dry land. 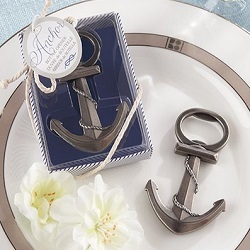 There are many nautical wedding favors on the market, but these 10 ideas are among the best. There are options for every budget, so choose wisely. 1. 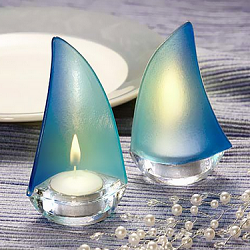 Sailboat Tea Light Holders: These holders will become an adorable part of your reception décor, and your guests will line up to take them home. The favors are made from heavy glass and are individually boxed for distribution among your guests. One tea light candle is included in each box. 2. 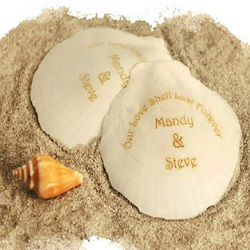 Personalized Seashells: If you have the budget to truly impress your guests, you can’t go wrong with seashells marked just for your special day. You may want to reserve these favors for your wedding party or other special guests who will keep them safe. 3. 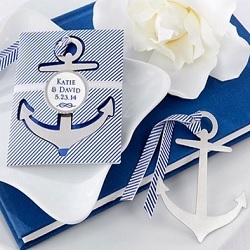 Brushed-Metal Nautical Bookmark: If you have bookworms attending your wedding or you enjoy reading yourself, this is the perfect addition to your wedding day. Bookmarks are made from metal, so they are durable enough to withstand years of page turning. 4. Personalized Metal Boats: Fill these boats with mints or small candies to create cute favors that look amazing on your reception tables. 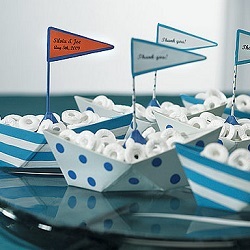 These boats come in fun blue and white designs that will add personality to your wedding. 5. 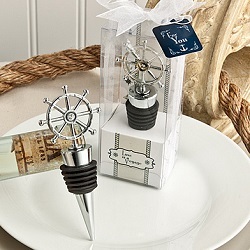 Nautical Bottle Openers: Why not give your guests something practical? A bottle opener will remind each guest of your special day every time they pop the top for an enjoyable time. The bottle openers are shaped like adorable anchors and arrive individually boxed. 6. 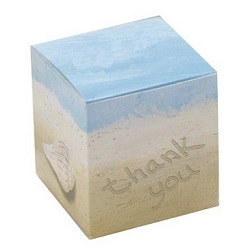 Seaside Jewels Favor Boxes: These well-designed nautical favor boxes capture the blues of the sea beautifully. Each box is softly colored to represent the shoreline, so you can easily incorporate the beach and surf into your wedding day. Fill the boxes with candy or favors of your choice for a sophisticated favor all guests will appreciate. 8. 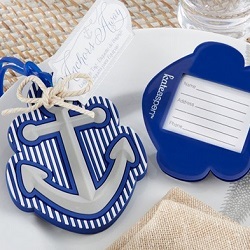 Anchor Luggage Tags: Help your guests pack their bags and set sail with these blue and white luggage tags shaped like anchors. This is a higher-priced wedding favor idea, but it may work well if you have select travelers in your group whom you would like to recognize at your wedding with something special. 9. 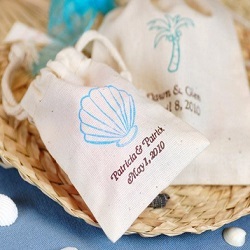 Personalized Cotton Wedding Favor Bags: These nautical-themed bags are personalized for your wedding, so your guests will cherish them as keepsakes. You can fill them with candy for an affordable wedding favor idea. 10. Kissing Bells: These kissing bells are so much fun and add to the overall theme. Don’t worry. There will be plenty of kissing when you put these on the table.